I hope that everyone has been enjoying the List Eruption, launch week tips so far. As we are getting closer to the List Eruption launch (fyi…Tuesday, May 3rd at 10am EST) I wanted to provide you with yet another simple and effective way that you can be rapidly building your email marketing list! 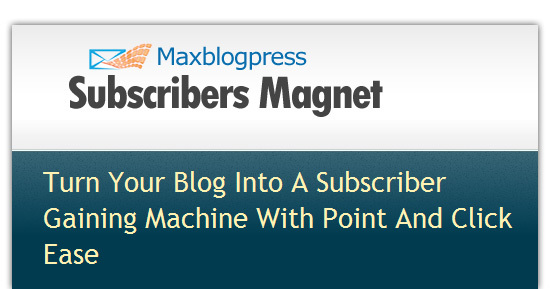 Tip #3 is going to talk about an amazing plugin by MaxBlogPress that is a subscriber generating machine. Personally I like to have as many possible ways for my readers to easily sign-up for my list. Everybody interacts with a website differently, so it is important to have multiple triggers to entice the reader to sign-up for your list. A tool called Subscribers Magnet, does just that! This tool is fantastic at converting your current blog traffic into subscribers. It utilizes multiple tactics to make it super easy for people to Opt-In to your offer. The problem with Opt-In forms is that they usually are not very appealing. Subscribers Magnet will create an appealing form that can be shown in your sidebar, pop-ups, in a blog page or post, in the footer and when someone leaves a comment. Subscribers Magnet is able to auto populate the fields of your form with the users name and email address, making it even easier to get the user to opt-in to your offer. This feature automatically subscribes the commenter after they leave a comment on your blog. This plugin will automatically send them an email requesting they double opt-in to your list. That means that commenters are just ONE click away from being on your list. As you can see this tool offers a variety of options and features that will boost your subscriber rates!